Westholme is one of the top schools in the country and has enjoyed over 90 years of success. Yet, Westholme began life in very humble circumstances. We trace the history of this renowned Blackburn school. Westholme School was founded by Miss Emily Singleton on April 19th,1923. Her creation of a school which now has more than 800 pupils, superb facilities and takes a very high position in national league tables is remarkable. Just becoming qualified was a feat for a woman in the 1910s. Emily Singleton was a Blackburn woman; her family was not particularly wealthy and in any case at that time a university education was almost entirely reserved for boys. She went to Dudley College where she completed the teacher training course in half the normal time so as to save money for her family. Her first job was in Blackburn but then she moved to Yorkshire only finding herself having to return to Blackburn as her mother was ill. In the Great Depression there were very few jobs to be had. She looked at her problem with calm logic. If she could not find a school to take her, then she would have to make a school. Emily approached a family with two young children and with one other she started her school. She based the school in the Wesleyan Chapel on Preston New Road. The furniture bill came to 41 15s 0p and at night it had to disappear to make way for evening functions. By the end of the first term, pupil numbers had doubled; there were six. From these small beginnings, Westholme has never looked back. More pupils came and it gained its name when Emily Singleton moved the school into her parents home, 167 Preston New Road, which was called Westholme. Soon this house also was too small and it could not provide the grounds for games so she moved again, this time to Billinge House. The new school was very proud of its latest technology: radio, gramophone, lantern and kinematograph. It was also gaining a reputation for a first rate education which it continues to hold today. By 1948, the school had been recognized by the government and had 135 pupils. It was still essentially a primary school but now Miss Singleton faced another dilemma. Her pupils did not want to leave! They asked for a senior school. The government inspector gave her 2 years as a trial period to set up a secondary school but she had to find new premises. By now she was nearing retirement and she needed to find a buyer who would continue her work at the school. Returning from fighting on the Normandy beaches, Mr Arthur Rouse was that man.He became the next Principal and joined the school from the University of Salford and his wife became the Headmistress of the Senior School now located at Beardwood Bank, also on Preston New Road. 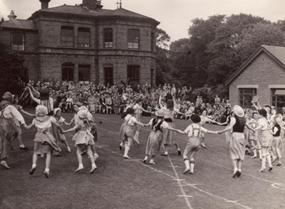 In 1968, the school became a Charity administered by a Board of Governors and moved to Wilmar Lodge on Meins Road in September of that year. A building programme was begun on the ten-acre site and an assembly hall, laboratories, swimming pool, sports hall, a five-acre playing field, music centre and art studios were built. 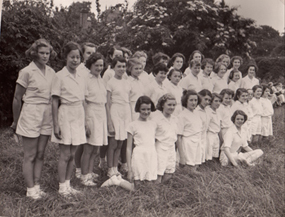 The Sixth Form was established and Westholme girls were moving on to top university places. The building programme has never really stopped. On the appointment of the then Principal, Mrs Croston, a science wing was completed. The theatre was opened in 1997 and in 1999 the new library, ICT facility and languages classrooms were ready. In 2012, the brand new extention to the Music Centre was completed, allowing for more space for orchestra and choir rehearsals. With demand for students taking A-levels, Westholme has now added a Sixth Form centre, which was completed in September 2003 and was refurbished in summer 2014. Billinge House is now the Infant School for girls and boys aged 2-7 and Beardwood Bank is the Junior School for children aged 7 -11 years. Both buildings have been extensively modernised and every classroom has an interactive whiteboard. In November 2014, our Nursery building was relocated from 290 Preston New Road and is now based within the Infant School site. The following year saw our Nursery welcome babies from the age of 3 months into the Westholme family. Pupils travel to Westholme from throughout Lancashire and from as far afield as Greater Manchester and the Fylde. Around 800 girls and boys aged 3 months to 18 years attend the school every day. It is a far cry from the original opening, in a makeshift room with just 3 pupils, but Westholme’s attraction lies in the fact that it has never lost sight of its roots and traditions. Westholme has a happy family atmosphere, where children do very well indeed. For 25 years, Principal, Mrs Croston developed the School and steered it through many new directions, before retiring in 2013. In September 2013, Mrs Horner became our new Principal and we are enjoying continued development of the School as we move towards its centenary year. Our latest development which was implemented in September 2016 was the introduction of boys into our Sixth Form. From September 2018, the school became coeducational throughout.